I took a little bit of time for myself this morning and whipped up this card for the Bah Humbug Challenge and I used the sketch from The Paper Players. A quick update on my Mom--she's still in rehab and I'm going up every afternoon. She's still having trouble swallowing so they are doing a test on that today. Other than that we're in limbo, don't whether I will be able to bring her home or if she will have to go to a nursing and rehab facility. Just taking one day at a time and keeping on steppin'. Thanks for all the thoughts and prayers, very much appreciated. Supplies: Ivory Card Blank 4" X 5 1/2" Halcraft, Papers: The Paper Studio-Greetings of the Season, Stampin Up-Very Vanilla, Stamps: Recollections-Christmas Collage, Inkadinkado-Penquin Pandamonium, Autumn Leaves-Flourishes by Rhonna Farrer, Ink: Ranger Archival Ink-Sepia, Stampin Up-Cherry Cobbler, Soft Suede, Old Olive, Chalks, Sharpie Paint Pen-gold, Stampin Up-scallop trim border punch, McGill-Vintage Label punch, Spellbinders Nestabilities-Classic Scallop Oval Lg. 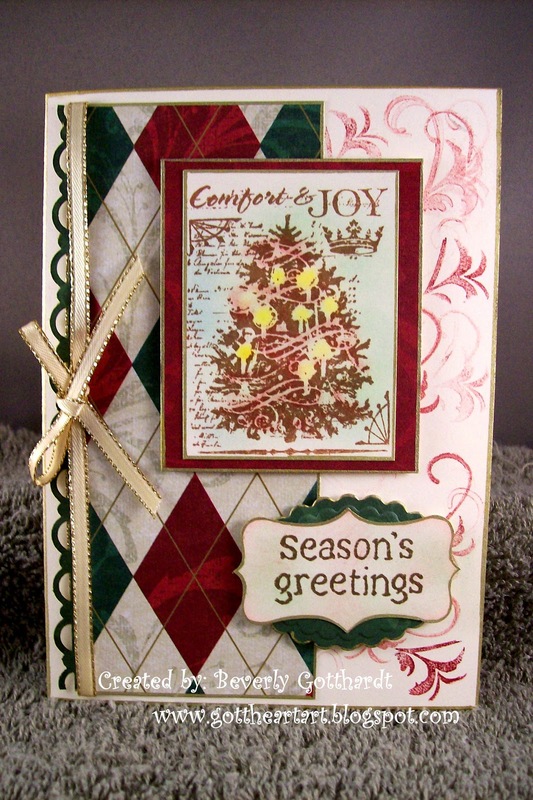 , ribbon-Michael's, Stampin Up dimensionals, glue dots. Wow - I love how you matted the sentiment as well as outlining it in gold. Love the gold that is carried throughout the card. Love the touches of gold! 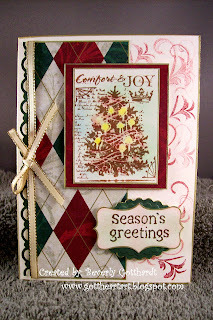 Such a lovely "Bah Humbug" card! Sorry about your Mom. I am happy for the two of you that you are close enough to visit! Take care of yourself, while trying to take care of your Mom! Good thoughts and prayers are with you. So sorry to hear about your Mum Beverly. You must be really worried about her. Glad to see you are getting some crafting done too - it does help to take your mind of worries sometimes. I (Ann) am typing this on Max's computer - staying at her house (the Scottish wing of Bah! Humbug!) this week. You can imagaine what fun we're having. Your entry is just gorgeous. Hope you'll have chance to join us again in next week's challenge. Love from Ann and Max. Beautiful, Beverly! I love the touch of gold! Gorgeous ribbon and bow. Thanks for joining us at The Paper Players! Gorgeous images and colors! Thanks for playing with the Paper Players this week! Hope your mom is doing better, My thoughts are with you. I am happy to see you again at the Paper Players, your work is beautiful and so distinctive. The gold highlighting is glorious! Such a beautiful card. The gold accents are just gorgeous. So sorry to hear about your Mom. Keeping you in my thoughts. Thanks for playing along with us at The Paper Players this week!